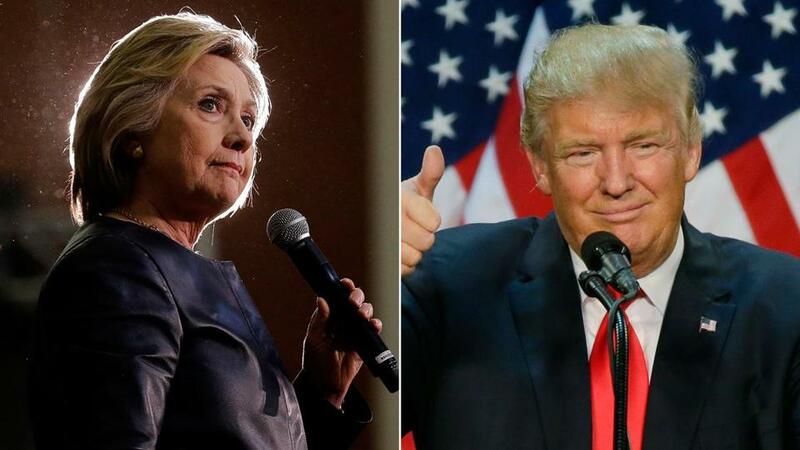 Hillary Clinton leads Donald Trump by 24 percentage points in Massachusetts, a new poll found. Presumptive Republican presidential nominee Donald Trump would face a steep uphill climb in Massachusetts against former secretary of state Hillary Clinton, trailing the Democrat by 24 percentage points, according to a new Suffolk University/Boston Globe poll. Clinton, who narrowly edged Senator Bernie Sanders of Vermont in the state’s March 1 primary, drew support from 55 percent of Massachusetts voters questioned, while Trump received 31 percent in a possible November general election matchup, according to the poll. The poll also found that Governor Charlie Baker continues to enjoy unusually high levels of support, with some seven in 10 voters questioned approving of the job the Republican is doing. In the presidential race, Clinton was viewed less favorably than Sanders, who has continued to dog her quest for the Democratic nomination. Forty-seven percent of voters have a favorable impression of Clinton, while 43 percent view her unfavorably. Sanders had a 55 percent favorability rating and a 32 percent unfavorable. Still, the poll found voters support Clinton as the Democratic nominee, outpacing Sanders by just over 12 percentage points. The entirety of her margin comes from female voters, with nearly six in 10 women opting for her. Donald Trump trails Hillary Clinton by 24 percentage points in the state, according to a new Suffolk University/Boston Globe poll. In the state primary, Clinton topped Sanders by 50.1 percent of voters to 48.7 percent, or just over 17,000 votes. The contest was open to unenrolled voters not affiliated with either party. The survey, conducted by telephone, queried 500 likely general election voters from May 2 through May 5, and carries a margin of error of plus-or-minus 4.4 percentage points. Even in a historically unpredictable political season, the study points to Massachusetts remaining in the Democratic column for the general election, as it has every year since 1984, when the state joined President Ronald Reagan’s reelection landslide. If the Democratic race remains relatively static and Clinton captures the nomination, just over half of Sanders’ Massachusetts followers would vote for her, while 8 percent said they would vote for the Republican nominee, 11 percent said they would consider a third-party candidate, and 7 percent would stay home. Paul Fuller, 78, of Dorchester, said he was still undecided but likely to vote for Clinton, after siding with Senator John McCain in 2008 and President Obama in 2012. In part, he said, his thinking this year has been driven by his view that Trump relies too heavily on “sweeping generalizations about things” like immigration. “Maybe he’s a little bit extreme on some things, but I’m still open to see how it all turns out, to see if he might modify somewhat,” Fuller said. Robert Maccini, 81, of New Bedford, said he plans to vote for Trump. Trump handily won the GOP primary here, posting what was at the time his largest vote share in any state. Backers insist his unorthodox candidacy could jeopardize Massachusetts’ status as a reliably Democratic state in presidential elections, a notion some analysts have dismissed as foolhardy. The poll also tested a number of Massachusetts politicians and state policy issues. Baker enjoys a 66 percent favorability rating, with just 12 percent seeing him unfavorably, and he is significantly more popular with white voters than nonwhites. Seventy-one percent of voters surveyed approved of Baker’s job performance, while just 11 percent disapproved. 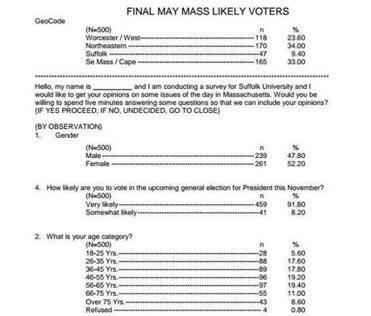 Those numbers are virtually unchanged from a Suffolk poll taken in November, showing Baker holding steady. The Swampscott Republican was elected by a historically narrow margin in 2014 and, if he chooses to seek a second term, would face reelection in 2018. A little more than half called Baker a moderate, compared with 18 percent who see him as a conservative and 10 percent who consider him a liberal. That split depicts a state significantly more upbeat than it was on the eve of Baker’s 2014 election, when voters were evenly divided on the same question, according to a Suffolk poll taken at the time. Tanya Bart, 50, of Northampton, is a self-described Democrat who plans to vote for Clinton, but is among those who think Baker so far has done a good job as governor. Likely Clinton voters were divided roughly evenly when asked about Baker’s job performance, while likely Trump backers were more likely to disapprove of it. Baker’s popularity makes him the best-regarded politician included in the survey. Senator Elizabeth Warren also performed well, earning a 52 percent favorability rating, with 33 percent viewing her negatively. Senator Edward J. Markey was viewed favorably by 36 percent, with 26 percent saying they view him unfavorably. The only other Massachusetts politician tested, Attorney General Maura Healey, garnered a 35 percent positive rating and 14 percent negative. About 38 percent of those surveyed had never heard of or were undecided about Markey, while nearly 51 percent said the same about Healey.